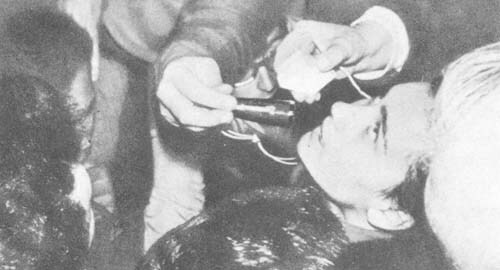 Had the visionary not been in a real trance, her open eyes, which withstood the concentrated beams of so many spotlights, would have been burnt out in a matter of minutes, and, today, Conchita Gonzalez would be blind. On the contrary, she came to quite normally, without being dazzled at all, and her eyes are as expressive and healthy as ever. The dense crowd made it practically impossible for Conchita to retrace her steps down the lane. 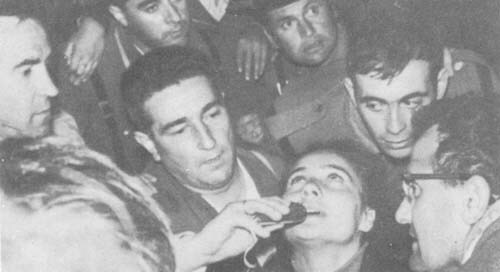 The Civil Guard and several village youths protected her from the buffeting as best they could, forcing a path through the tightly packed crowd. Several people slipped and fell as they scrambled down the lane, and those behind stumbled over them. A voice was heard calling for help. I felt a sudden fear, thinking of the possible consequences of that human avalanche. But, once again, the miraculous happened; quite inexplicably, there were no casualties. I reached Conchita's house and managed to squeeze through the door. She answered our questions with that natural air of one who cannot see the importance of the phenomena in which she is playing a leading role.